Stock photo of the City of Niagara Falls skyline as seen from along the Niagara Parkway beside the Niagara River at sunset in Ontario, Canada. 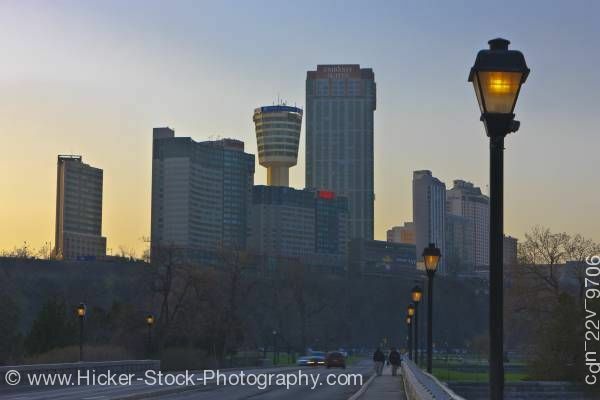 This stock photo includes the City of Niagara Falls skyline in entirety as seen from along the Niagara Parkway beside the Niagara River at sunset in Ontario, Canada. Looking at the city skyline in silhouette against a faintly golden sunset with a dark upper sky from a spot along the Niagara Parkway, a road lined with streetlamps and a few cars leading into Niagara Falls.